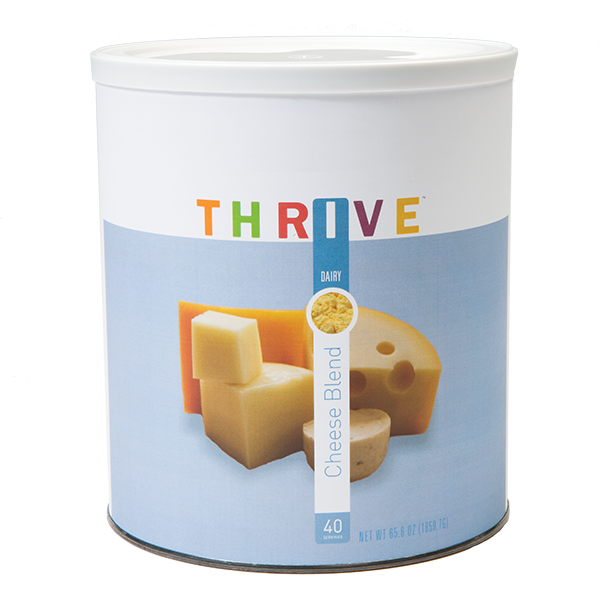 Thrive Cheese Blend is a powder that is packed with a rich, cheesy flavor. Try using it in fondue or mix it with noodles for homemade mac & cheese. You can also add it to chip dips and casseroles to create a bold and delicious taste. To make cheese sauce, prepare 7 1/2 tablespoons Thrive Instant Milk with 1/2 cup heavy cream, and bring to a simmer. Stir in 1/2 cup Thrive Cheese Blend. Make a roux with 2 tablespoons butter and 2 1/2 tablespoons flour, stir into sauce, and simmer for 2-3 minutes. Season with 1 teaspoon Thrive Iodized Salt and pepper to taste. Makes 8 servings. To prepare as cheese sauce, combine 7 1/2 tbsp. Instant Milk Powder, 1 1/2 cups water, and 1/2 cup heavy cream in a saucepan and bring to a simmer. Stir in 1/2 cup Cheese Blend and 1/4 cup reconstituted THRIVE Shredded Cheddar Cheese. Make a roux with 2 tbsp. butter and 2 1/2 tbsp. flour; stir roux into sauce and simmer for 2-3 minutes, Season with salt and pepper to taste. Just add noodles to the cheese sauce for easy mac and cheese, or serve it over baked potatoes. Use the powder to flavor dips, sauces, homemade chips and crackers, and cheesy soups. Add THRIVE peppers, onions, and hot sauce for a great queso dip.